Megumi Shimizu is a second year PhD student at the Duke University Marine Lab. Since the news has so far only been reported in Japanese, we asked her to provide a short write-up of the discovery. 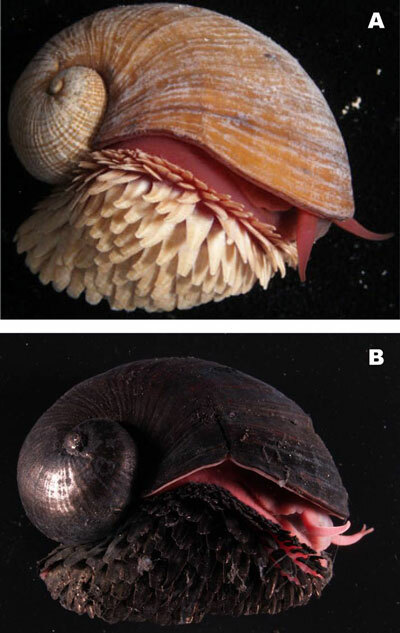 The first scaly-foot gastropod, Crysomallon squamiferum, was found in the Indian Ocean ten years ago (Van Dover et al 2001), and continues to attract deep-sea fan with its black appearance and iron-fortified shell and operculum. Last December a team from JAMSTEC (Japan Agency for Marine-Earth Science and Technology) reported the discovery of a white scaly-foot gastropod in the Indian Ocean. The exciting news was announced in Japan soon after the conclusion of the research cruise. Except for its color, the shape and characteristics are the same as the black scaly-foot gastropod. Unlike the mysterious black one, the white one gives me different impression: pretty and innocent looking. They found white scaly-foot gastropod during an investigation of habitats at newly found hydrothermal vents in November 2010. Several aggregations of white scaly-foot gastropods were found at the sites. Although scaly-foot gastropods are usually covered by iron sulfide shell and scales, the white scaly-foot gastropod does not assimilate iron sulfide. The physiological details have not yet been revealed. Many questions come to mind from this discovery: Are they same species? How did they evolved? Why do black scaly-foots need iron scales? I am definitely looking forward to reading the final publication. Adventures in Backyard Agriculture: Building the Pico-farm. So what are the plates on the food composed of? I’m not confident that this is new species. Any word when the paper will be published?